There are several scenarios where you may run into trouble uninstalling the 2010 Beta and trying to install the RTM (final) release. Today we’ll cover the problems we ran into, and how to fix them. You would think upgrading from the Office 2010 Beta to the final release would be an easy process. Unfortunately, it’s not always that simple. In fact, we ran into three different scenarios where the install wasn’t smooth whatsoever. If you currently have the 2010 Beta installed, you have to remove it before you can install the RTM. Here we’ll take a look at three different troublesome install scenarios we ran into, and how we fixed each one. 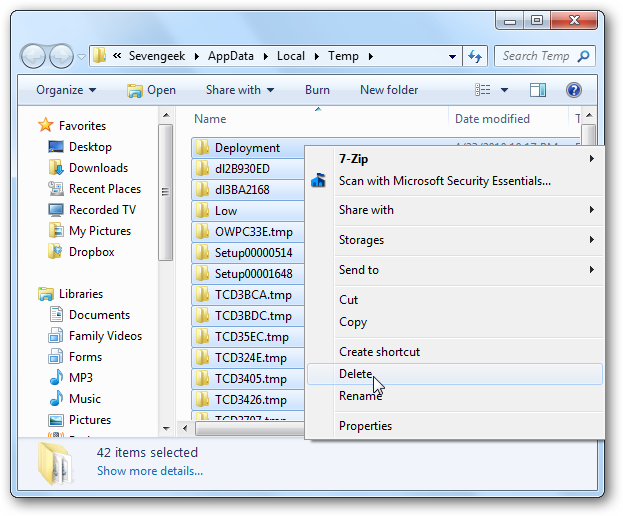 Important Note: Before proceeding with any of these steps, make sure and backup your Outlook .pst files! In this first scenario we have Office Professional Plus 2010 Beta 32-bit installed on a Windows 7 Home Premium 32-bit system. 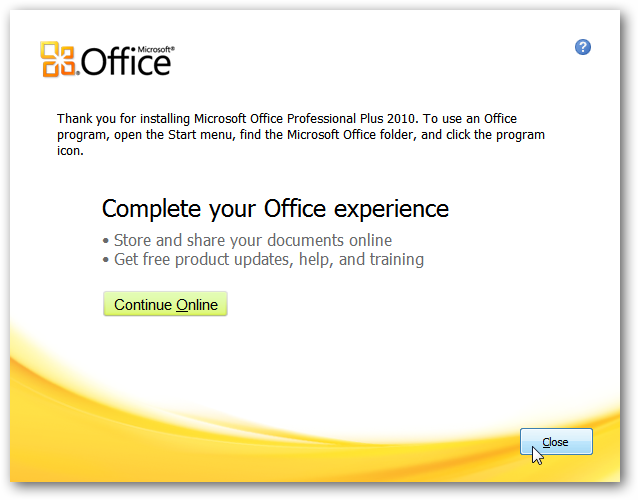 First try to uninstall the Office 2010 Beta by going into Control Panel and selecting Programs and Features. 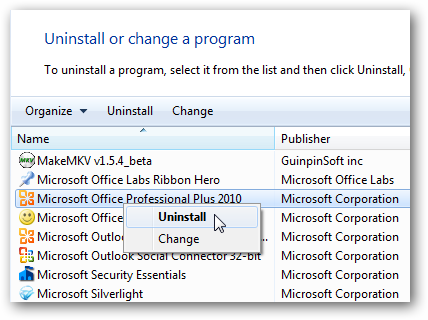 Scroll down to Microsoft Office Professional Plus 2010, right-click it and select Uninstall. Click Yes when the confirmation dialog box comes up. 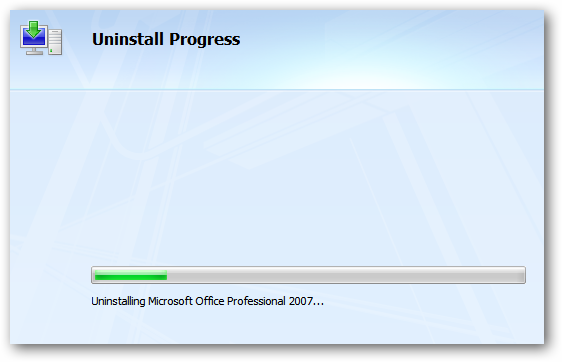 Wait while Office 2010 Beta uninstalls…the amount of time it takes will vary from system to system. To complete the uninstall process, a reboot is required. You get the following setup error even though you uninstalled the 2010 Beta. The problem is there are leftover Office apps or stand alone Office products. So, we need a utility that will clean them up for us. 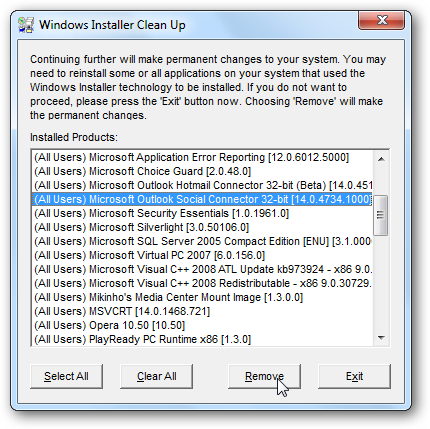 Download and install the Clean Up Utility (link Below) following the defaults. 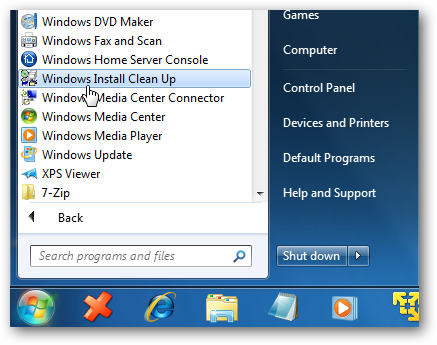 After it’s installed you’ll find it in Start \ All Programs \ Windows Install Clean Up …go ahead and launch the utility. Now go through and remove all Office Programs or addins that you find in the list. Make sure you are just deleting Office apps and not something you need like Java for example. If you’re not sure what something is, doing a quick Google search should help you out. For instance we had the Office labs Ribbon Hero installed… just highlight and click Remove. Remove anything that has something to do with Office…then reboot your machine. 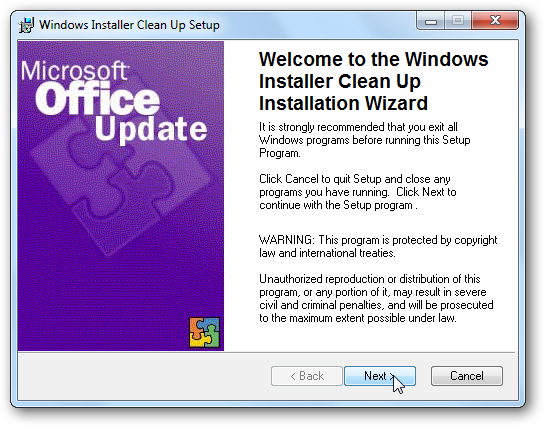 Now, you should be able to begin the installation of Office 2010 RTM (Final) Release without any errors. 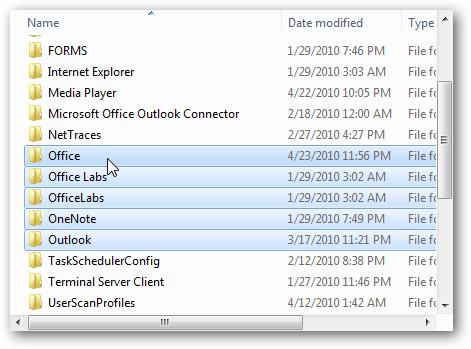 Navigate to C:\Users\username\AppData\Local\Microsoft (where username is the computer name) and delete any existing MS Office folders. Then try the install again, this solved the problem in our first scenario. In this next scenario we have Office Professional Plus 2010 Beta 32-bit installed on a Windows 7 Home Premium 32-bit system. 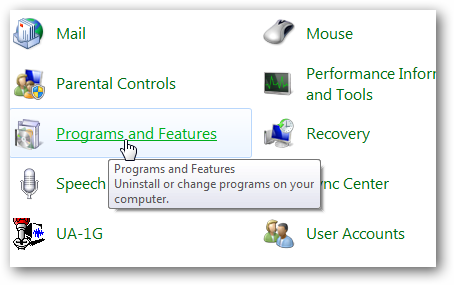 Another problem we ran into is not being able to uninstall the 2010 Beta from Programs and Features. When you go in to uninstall it, nothing happens. If you run into this problem, we again need to download and install the Windows Installer Clean Up Utility (link below) and manually uninstall the Beta. 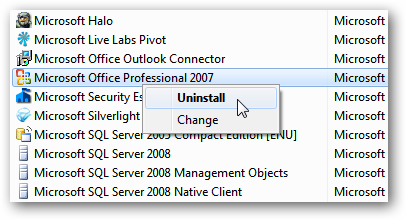 When you launch it, scroll down to Microsoft Office Professional Plus 2010 (Beta), highlight it and click Remove. 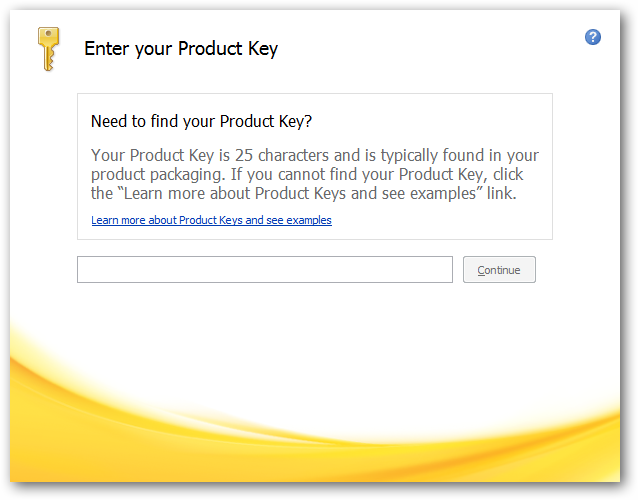 If you see any other Office 2010, 2007, or 2003 entries you can hold the “Shift” key and highlight them all…then click Remove and click OK to the warning dialog. Now we need to delete some Registry settings. Click on Start and type regedit into the Search box and hit Enter. 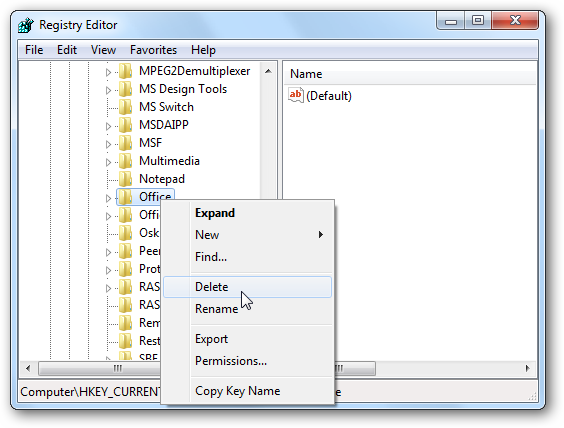 Navigate to HKEY_CURRENT_USER \ Software \ Microsoft \ Office and delete the folder. 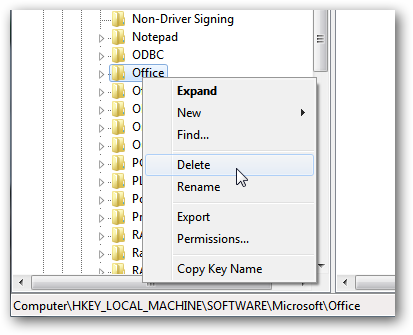 Then navigate to HKEY_LOCAL_MACHINE \ Software \ Microsoft \ Office and delete those keys as well. Now go into C:\Program Files and find any of these three folders…Microsoft Office, OfficeUpdate, or OfficeUpdate14…you might find one, two or all three. Either way just rename the folders with “_OLD” (without quotes) at the end. 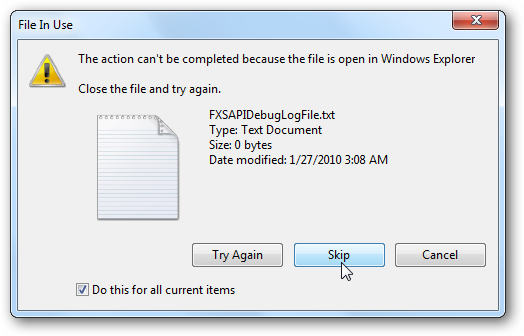 Then go into C:\Users\username\AppData\Local\Microsoft and delete any existing MS Office folders. Where in this example we have office, Office Labs, One Note…etc. Now we want to delete the contents of the Temp folder. Click on Start and type %temp% into the Search box and hit Enter. Use the key combination “Ctrl+A” to select all the files in this folder, then right-click and click Delete, or simply hit the Delete key. If you have some files that won’t delete, just skip them as they shouldn’t affect the Office install. Then empty the Recycle Bin and restart your machine. When you get back from the restart launch the Office 2010 RTM installer and you should be good to go with installation. 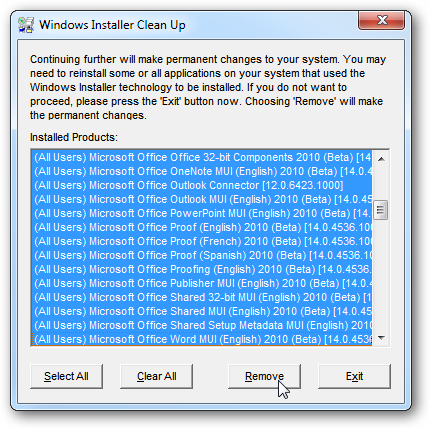 Because we uninstalled the Office 2010 Beta manually, you may have some lingering blank icons that you’ll need to clean up. 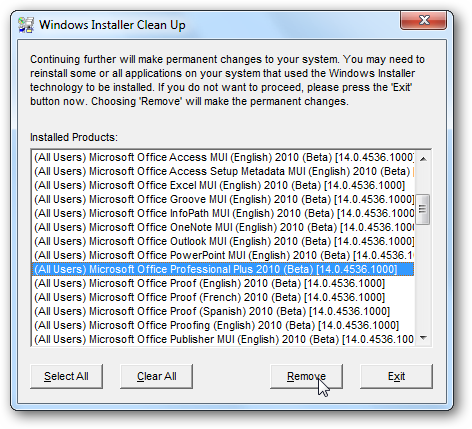 For this final scenario we are uninstalling Office Professional 2007 and installing Office Professional Plus 2010 32-Bit edition on a Windows Ultimate 64-bit computer. This machine actually had Office 2010 Beta 64-bit installed at one point also, it’s since been removed, and 2007 was reinstalled. Go into Programs and Settings and uninstall Microsoft Office Professional 2007. 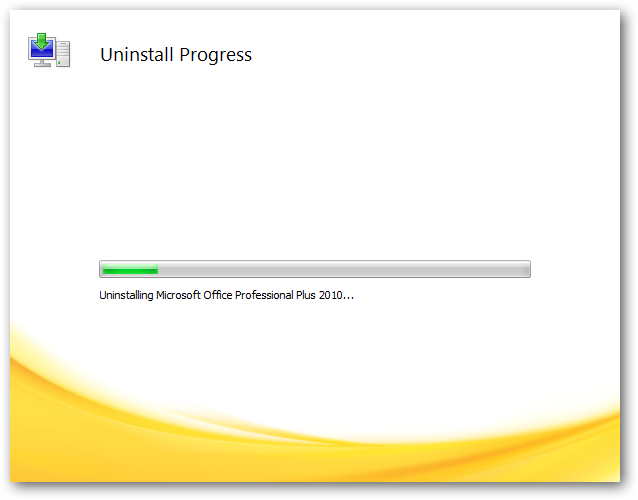 Then wait while Office 2007 is uninstalled. The amount of time it takes will vary between systems. Again we need to call upon the Windows Installer Clean Up Utility. 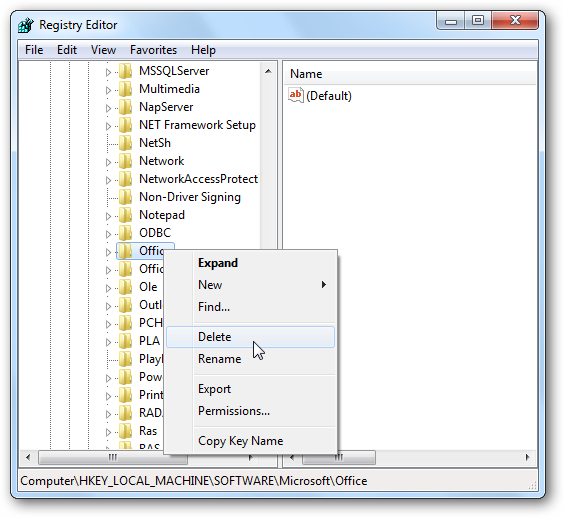 Go through and delete any left over Office 2007 and 2010 entries. Click OK to the warning dialog that comes up. 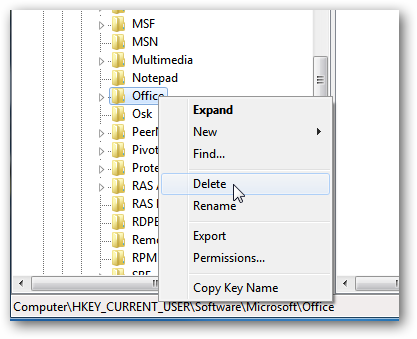 After that’s complete, navigate to HKEY_CURRENT_USER \ Software \ Microsoft \ Office and delete the folder. We still need to go into C:\Users\ username\AppData\ Local\ Microsoft (where username is the computer name) and delete any Office folders. 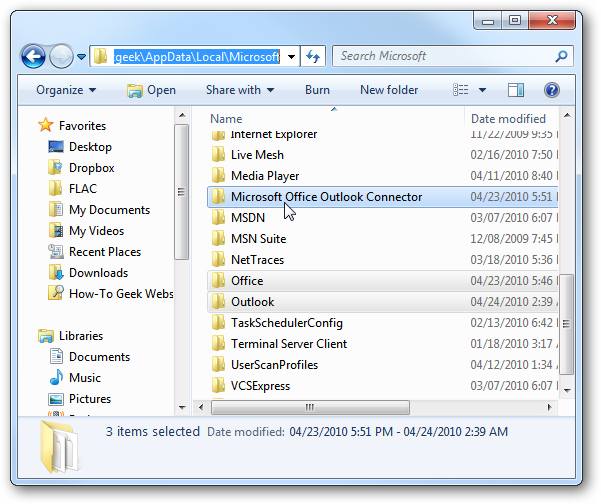 In this example we have Outlook Connector, Office, and Outlook to delete. 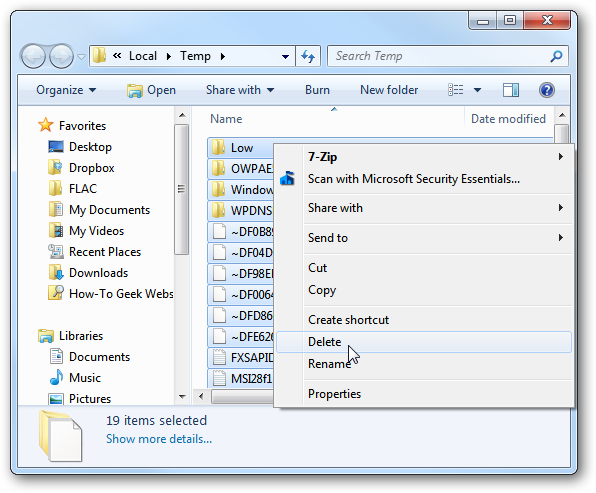 Now let’s delete the contents of the Temp folder by typing %temp% into the Search box in the Start Menu. Then delete all of the files and folders in the Temp directory. 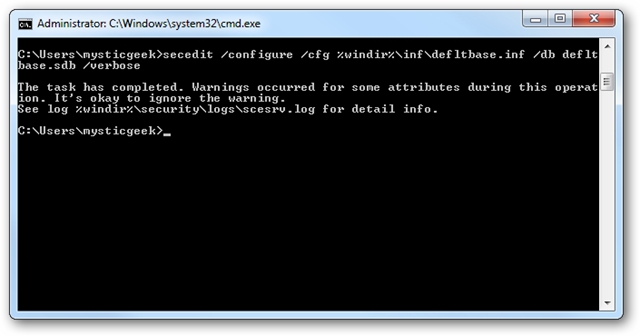 If you try to install the 2010 RTM at this point you might be able to begin the install, but may get the following Error 1402 message. 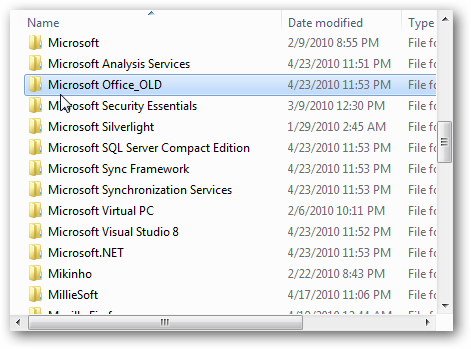 After the command completes, kick off the Office 2010 (Final) RTM 32-bit edition. 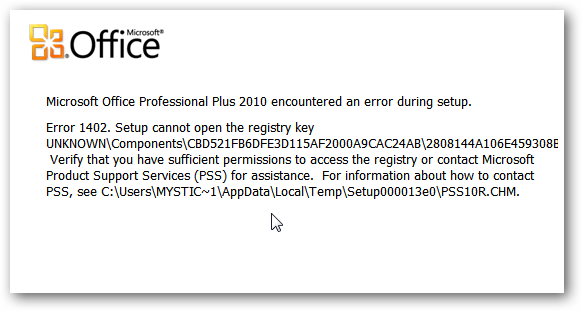 This solved the issue and Office 2010 installed successfully. 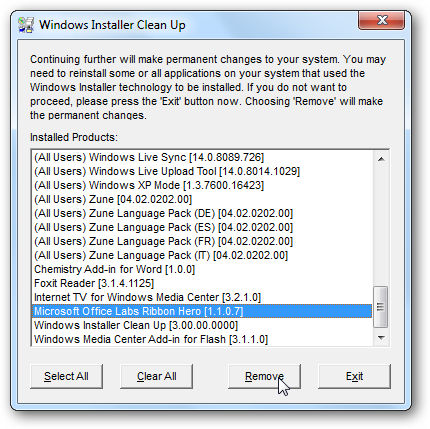 Except for the final scenario, we found using the Windows Installer Clean Up Utility to come in very handy. Using that along with deleting a couple folders and registry settings did the trick. In the last one, we had to get a bit more geeky and use some command line magic, but it got the job done. After some extensive testing in our labs, the only time the upgrade to the RTM went smoothly was when we had a clean Vista or Windows 7 system with a fresh install of the 2010 beta only. However, chances are you went from 2003 or 2007 to the free 2010 Beta. You might also have addins or other Office products installed, so there are going to be a lot of different office files scattered throughout your PC. If that’s the case, you may run into the issues we covered here. 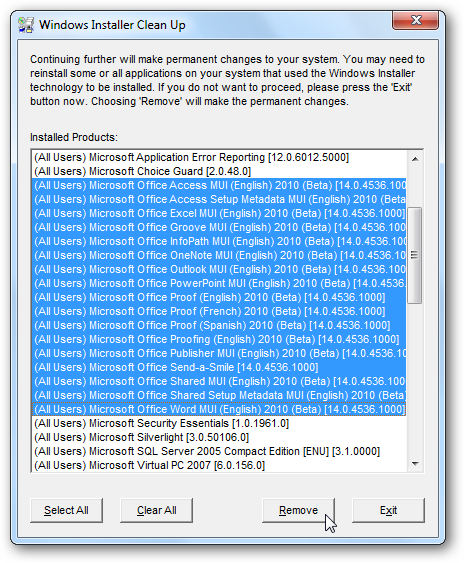 These are a few scenarios where we got errors and were not able to install Office 2010 after removing the beta. There could be other problems, and if any of you have experienced different issues or have more good suggestions, leave a comment and let us know!